Given limited computational resources available for rendering spatial sound imagery, it is important to determine effective means for choosing what components of the rendering will provide the most audible differences in the results. 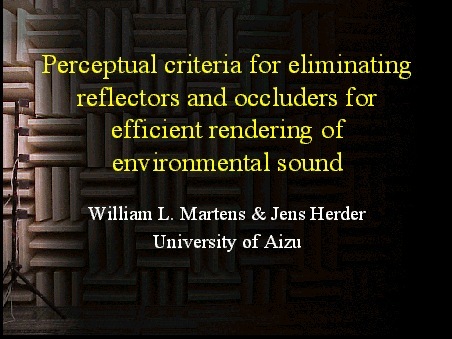 Rather than begin with an analytic approach that attempts to predict audible differences on the basis of objective parameters, subjective tests were executed to determine the audible difference made by two types of sound obstruction: reflectors and occluders. Single-channel recordings of 90 short speech sounds were made in an anechoic chamber in the presence and absence of these two types of obstructions, and as the angle of those obstructions varied over a 90 degree range. These recordings were reproduced over a single loudspeaker in that anechoic chamber, and listeners were asked to rate how confident they were that the recording of each of these 90 stimuli included an obstruction. The results revealed the conditions under which these obstructions have a significant impact on the perceived spatial image, most particularly as a function of the orientation of the obstruction. Results also showed that the identifiability of the difference between the sound of occluded vs. reflected or unobstructed sources was not reduced in the presence of simulated reverberation, even when theinitial time gap between the arrival of direct and indirect sound was very short. The average confidence ratings were incorporated into an evaluation function used in determining which reflectors and occluders are most important for rendering.